Kings of Leon released their seventh studio album WALLS in 2016 amid much curiosity about the album cover artwork. One of the questions many fans and reviewers posed was: Are those false eyelashes on the band's faces? Whether they are or aren't, you can give a shout-out to WALLS with this tote bag from RockAndRollTShirts.com. 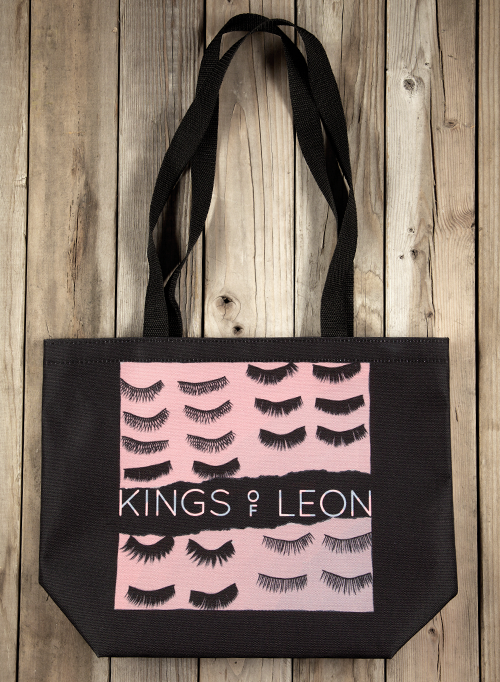 Made from a black canvas with bottom gusset and handles, this tote features a pop art-inspired graphic of false eyelash sets against a bubble gum pink background surrounding the band's name. The bag measures 15" wide x 12.5" high by 5" deep.